HealthRock is a health education company that uses music and entertainment to teach important health messages. It's like Schoolhouse Rock but about health. HealthRock songs have appeared on national radio and television and selected PBS stations. 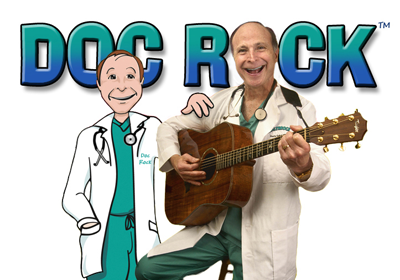 Founded by Dr. Mache Seibel, aka DocRock, an award winning physician and educator. Its advisers include the Dean of Harvard Medical School, Carroll Spinney (Big Bird on Sesame Street) and educators and childrens' experts. HealthRock presentations have been made across the country and recently Dr. Seibel was invited to make a presentation about HealthRock to the US Department of Health & Human Services. Listen, laugh and learn!